Today, Verizon is announcing the first two 5G markets and further details about the 5G Moto Mod intended for use with the Moto Z3. Starting on March 15, customers can pre-order the 5G Moto Mod for $50 by adding a $10/month surcharge to any Unlimited plan for 5G service. That Moto Mod has a full retail price of $350 and you'll need a Moto Z3 for the Mod to work, at least initially. Motorola would update previous-generation Moto Z devices to work with the Mod. We'd expect at least the Z2 Force would support it but the first-generation Moto Z, well... it's not certain. The 5G Moto Mod has a built-in 2,000 mAh battery to compensate for increased consumption while on a 5G network. The Mod itself contains Qualcomm's X50 modem. Check out the video below for a quick hands-on with a hardware prototype that we saw when the Moto Z3 launched in Chicago. Verizon is offering the first three months of 5G for free, as in it would delay the $10/month surcharge for three months. Verizon's first two markets will be Chicago - home of Motorola's headquarters, and Minneapolis. 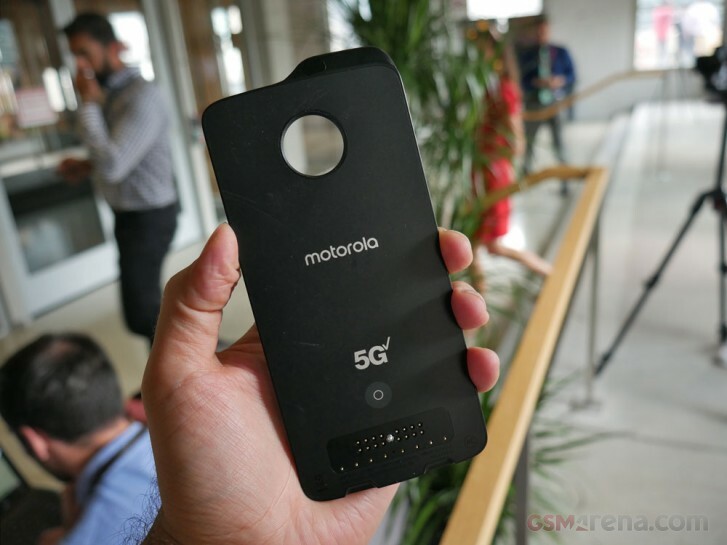 The Moto Mod 5G will be available for pre-order starting tomorrow and will become officially available on April 11, the same day that the two markets will fire up 5G signal for the first time. Is 5G signal going to be available in my home and work areas? If not then how soon? Wait until you see some real-world speed tests from independent firms or tech reviewers. Verizon plans to launch 5G home-broadband service as well. We are very intrigued to see how well a 5G connection can replace a hard-wired connection from a big Cable company as well as how service is affected in certain weather situations. We also wonder how Samsung and LG's 5G phones will fare in battery life on 5G networks. Bring on the 5G! 120 for a 5G Motomod funny. When 5G network is like to say in diapers. 120 euros for having 5G mod. Not thanks i stick to my 4G. But i would like to see successor to my Moto X4 my daily driver. Is it right that all phones with 5 g will be fat ?